Our school is going through the revalidation process to continue being an AVID National Demonstration School. Based on the feedback from a prior visits, the staff have been working on increasing Higher Order Thinking Skills (HOTS). Starting this year, the AVID site team began providing weekly instructional practices, developed a Google Form to collect best practices, and they meet with me on a monthly basis to coach me how to use HOTS in the weekly email, staff meetings, and for teacher feedback. We also began correlating the McREL Walkthrough data from last year as the compare the instances of remembering and understanding with analyzing and evaluating. The revalidation process has definitely caused our school to reflect on where we are and to improve in areas to make student learning better. It starts at the top. This year I made a pact with our AVID site team to hold myself accountable to modeling Higher Order Thinking Strategies. Prior to meetings, weekly blog/email to staff, and professional development I share with the team and they help me to take it to the next level! Point of Confusion. This AVID technique is extremely powerful for students as they engage in their weekly tutorials. They identify an area they are struggling with and share it with their peers. 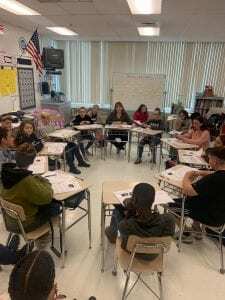 Their peers are taught to use questions to assist the students in understanding and making connections with the material. If the teacher, then the student. We made this chart to help teachers and students make small changes to increase HOTS. If the teacher…. Then the student will …. This process is something that can be put into practice at any school or level. The most important aspect to this is the professional relationship between the staff and the administration with identifying and solving the problem collaboratively. Everyone becomes the expert and everyone improves!